2018 Yamaha YZF-R6: Refined. Redesigned. Remarkable. 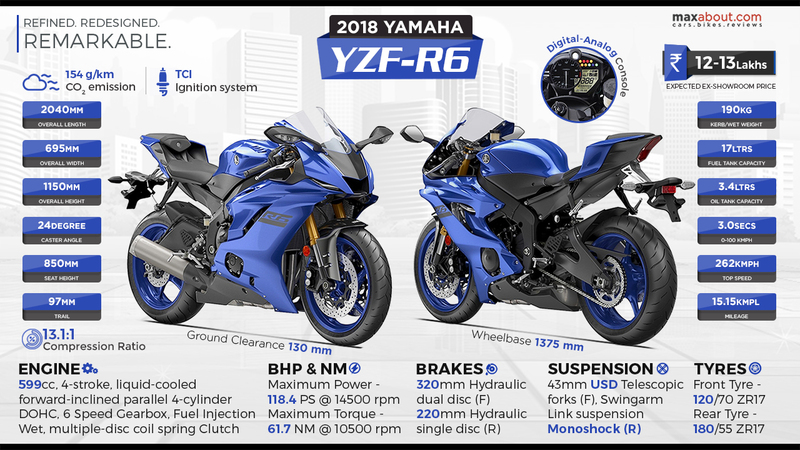 2018 Yamaha YZF-R6 was recently revealed internationally, carrying a design that looks highly inspired from the flagship Yamaha YZF-R1. The 599cc, four cylinder engine producing 118.4 PS at 14,500 rpm and 61.7 Nm at 10,500 on the R6 is very powerful and claims a 0-100 kmph sprint time of just 3.0 seconds. R6 claims a top speed of around 262 kmph on the R6 while it weighs 190 kg with 90 percent fuel and all fluids. The front disc brakes measure 320mm while rear comes with a single 220mm disc brake. Yamaha R6 offers a ground clearance of 130 mm while its 43 mm USD forks make it good for high speed track handling. Yamaha offers 120/70-ZR17 and 180/55-ZR17 tyres on front and rear of the motorcycle respectively. If launched in India, it could carry a price tag of around INR 12-13 lakh, placing it slightly below the liter class sport bikes. Downloaded 142 times this week.